Over 100 years, many changes have occurred in beer and brewing. Two great innovations have roots in the early 1900s and are still important. One is pure yeast culture, which I discussed recently. Its father is the Danish chemist Dr. Emil Hansen. He developed a reliable method to isolate a single strain of yeast from the mixed types that had evolved empirically in breweries and distilleries. This promoted better control in every phase of fermentation and a predictable, acceptable flavour. The other great innovation, rarely mentioned in consumer literature, was the invention of closed fermentation by Dr. Leopold Nathan, a Swiss inventor. He had a technical background of some kind but was not a trained engineer as far as I know. He invented the cylindrical fermenter with a conical base, equipment used in any scale of modern brewing, from brewpub to mega-plant. While not every brewery uses it, it is fair to say most do. He first patented the system in the U.S., before WW I. It slowly was adopted in the English-speaking world and finally on the Continent. Between the two world wars Australia was a cradle for its implementation via Peter Hay who founded the Richmond Brewery. (See his Wikipedia entry, it’s very informative). The system, which was initially felt suitable only for lager production, was tested in the same period in Britain, stronghold of ale (top) fermentation. After World War II, British breweries started to adopt Nathan’s system in earnest, as explained by D.R. Maule of Whitbread R&D in this absorbing article over 30 years ago entitled “A Century of Fermenter Design”. Maule’s first page is a great snapshot of where British beer fermentation started from. A multiplicity of systems was in use at the end of the 1800s, empirically-developed and often regionally-based. They were i) the Yorkshire stone square, ii) skimming system, iii) dropping system, iv) Burton Union system (linked open casks to vent excess yeast), and more. Today, brewing extensively relies on Nathan closed fermentation. Some small brewers still use flat bottom fermentation, closed or open, but generally closed. Mostly, conical systems have taken over, even in traditional Belgian brewing, e.g., the Trappist brewery Chimay uses them. Continuous fermentation is the other main modern method. It’s a complex system of linked tanks which operate for months until shut down for cleaning and maintenance. This method makes them suitable for producing one beer or one main brand. For example, Guinness uses this system. Nathan’s invention permitted wort to be fermented and conditioned in a couple of weeks vs. (for lager) three to four months or more under the older system. The closed fermentation meant the beer was beyond the predation of airborne organisms. CO2 was not lost to the atmosphere as in open tanks, but could be vented in a controlled way, “washed” of its green flavours (DMS, etc. ), and re-introduced to the beer. The use of temperature with pinpoint control permitted cold crashing, hence clarification of beer months ahead of the traditional schedule. Maule explained that the system gained traction in the U.K. particularly after CIP (cleaning-in-place) was perfected for Nathan fermentation. Nathan’s basic design, as shown in a reproduction in Maule’s article, continues virtually unchanged today. One new element is the unitank variation, where the beer conditions 100% in the fermenter vs. use of a separate brite tank as it’s called. Unitanks are often useful for brewpubs. 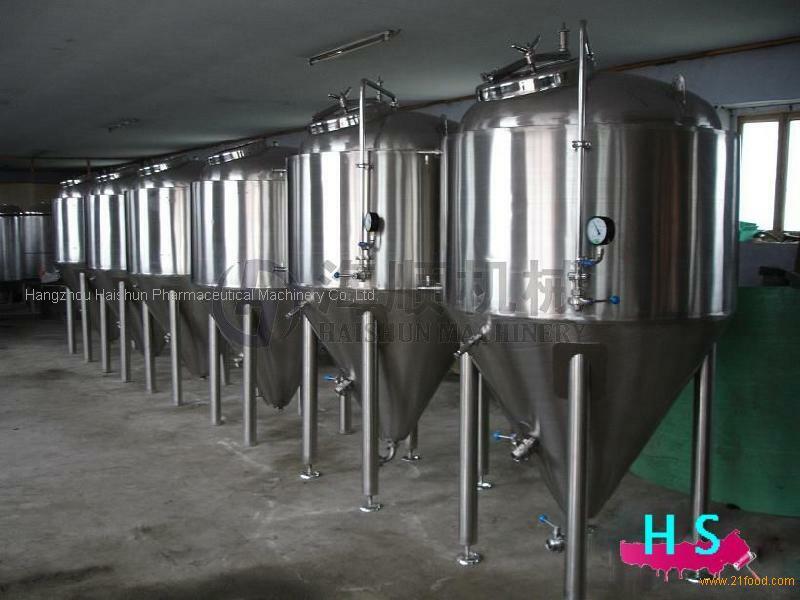 Breweries which filter their beer generally use the separate brite tank, which also permits more storage capacity and better utilization of fermenter capacity. Who was Leopold Nathan? Very little can be gleaned at least from online searches. He was a German-born, Swiss national, active from about 1900 into the 1930s, but after that, a blank. He is a titan of modern brewing, as attested by the longevity and reach of his system, for any kind of beer, at any scale of production. He deserves to be better known. To the names Pasteur, Hansen, Fritz Maytag, Ken Grossman, Jim Koch and Jack McAuliffe we must add Leopold Nathan for his great impact on brewing today. The image above was sourced from the site of this Chinese food processing equipment manufacturer. All intellectual property therein or thereto belongs to the lawful owner or authorized users. Believed available for educational and cultural purposes. All feedback welcomed. Thanks Jay, good info, and nice to hear from you.